First of all can we talk about how proud I am of these pictures!? I got a ring light!! Okay sooo anyways. I finally got this palette at Christmas and having had it for 4 months I’ve made up my mind on what I think of it. Firstly, packaging is gorgeous, comes with a mirror and feels really good quality. Now onto the important bit. Mattes – absolutely gorgeous, pigmented formula that’s so easy to work with, up there with my favourite formula of mattes with ABH shadows. I love using the mattes as a one shadow look as they’re super pretty and don’t crease. I love that the tones of pink are muted and neutral, overall nicely pigmented creamy and user friendly. Foiled – these are best applied with your finger, they’re such unique and interesting shadows! I love putting these on the lid with a matte in the crease it gives such a quick soft glam look, however I can’t put these in my inner corner with a brush as it gets chunky on a brush and the glitter gets in my eyes which slightly irritates them. Shimmer – there’s only one shimmer shade that isn’t foiled, which is ‘flirty’, a gorgeous cranberry shade which again works great as a one shadow wash of colour. 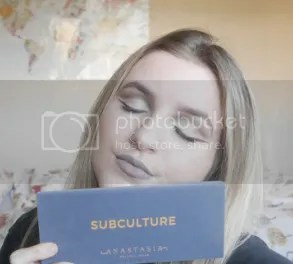 I wish there was a white basic shimmer for the inner corner in this palette! Glitter – there’s two glitters that pretty much look the same on the eye, and I’m not a fan of the glitters, they’re chunky and messy and don’t stick on the eye well. I had to completely redo my eye makeup in a rush when the glitter ruined my eye look. Concealer – this is a pretty decent conceal shade but I don’t really reach for it. It’s a little heavy feeling and not good for cutting the crease with, I’m not sure what the point was with this concealer, is it supposed to be a base? Let me know please! Overall, worth the £56? I’m really stuck on this because I don’t like the glitters or concealer shade, the foils are a pain to work with sometimes, but I always reach for it and love how my eye look turns out. I would buy the Modern Renaissance instead if you’re thinking of buying this, or the Queen of Hearts palette by Coloured Raine.